Are your kids preparing for the Oregon Assessment of Knowledge and Skills? Also known as OAKS, these Oregon standardized tests measure the progress of students from 3rd grade to 8th grade, and 10th grade. Parents and caregivers will want to learn more about Oregon’s statewide assessment, which now features OAKS Online, a new online testing system. Results from the OAKS tests provide actionable data that will help parents/caregivers, teachers, and students improve academic performance in reading, math, writing, science, and social studies. OAKS testing also helps determine each school’s Adequate Yearly Progress (AYP) as required by the federal No Child Left Behind Act (NCLB). Time4Learning, an online service that teaches many of the tested skills, offers this page to help you understand the Oregon Assessment of Knowledge and Skills, and how you can help your children with OAKS test practice and preparation. 3rd and 6th Grades: OAKS tests in reading and math. 4th and 7th Grades: OAKS tests in reading, math, and writing. 5th and 8th Grades: OAKS tests in reading, math, and science. 10th Grade: OAKS tests in reading, math, writing, and science. In fifth, eighth, and tenth grades, schools may also give an optional OAKS social studies assessment. The OAKS Online system is used for reading, math, science, and social studies tests. OAKS Online is a computer-based adaptive test, which means it self-adjusts during test-taking in response to each individual student’s performance. Paper and pencil tests are also available and used for some exams, such as the OAKS writing test. The OAKS assessments are criterion-referenced tests, as opposed to norm-referenced tests. Thus, your child will only compete against him or herself, rather than be compared against the group. The Oregon Assessment of Knowledge and Skills measures how well students have mastered the challenging Oregon Content Standards, and reports student performance in each subject using the following five levels: 1) Exceeds, 2) Meets, 3) Nearly Meets, 4) Low, 5) Very Low. While students’ OAKS assessment scores will not affect their grade-level promotion or retention, school districts may take action in cases of under-performing students. At a minimum, OAKS test results identify students who need additional assistance. If your child is struggling with OAKS testing, be proactive. Talk to your child’s teachers and find out what you can do to support learning at home. Oregon uses a balanced range of assessments to promote learning for all students. OAKS Extended Assessments are designed to measure the progress of students with cognitive disabilities who require special accommodations. Students who are identified as English Language Learners take the English Language Proficiency Assessment (ELPA), which measures their progress in English language acquisition. Oregon also participates annually in the National Assessment of Educational Progress (NAEP), known as the Nation’s Report Card, where a sampling of students (from grades 4, 8, and/or 12) are tested in several content areas as part of a nationally representative assessment of student performance. A good resource on Oregon state testing is the Oregon Department of Education’s assessment webpage. For general tips on test preparation, please visit our standardized test overview page. The real preparation for the OAKS tests, or any standardized test, begins with your commitment to your children’s education throughout their school years. Devote time and effort to helping your children learn. Start by making sure your kids do their homework and read every day. Many families also employ tutors or an online learning program, such as Time4Learning, to build fundamental skills. When preparing for standardized tests, students often benefit from test prep programs and books, which offer guidance and practice with test formats, time restrictions, test-taking strategies (when to guess, when not to), and different types of questions. For instance, when a reading passage is followed by comprehension questions, many test prep programs teach students to scan the questions first in order to know what areas of the passage require close reading. Time4Learning is not a test prep program, it is a program that builds the skills that will be tested. Time4Learning is a new approach that takes advantage of today’s technology. It’s a convenient, online home education program that combines learning with fun educational teaching games. The online language arts and math curriculum comprise a comprehensive program for preschool, elementary school, and middle school. Science and social studies programs are provided for most grades. Time4Writing provides highly effective 8-week writing courses online that help elementary, middle and high school students build writing skills through one-on-one interaction with a certified teacher. 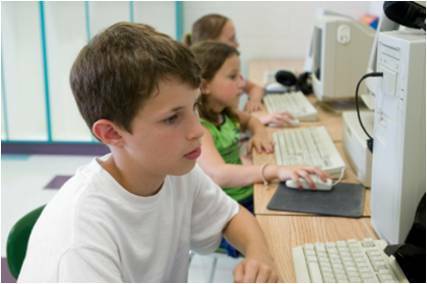 Kids like using the computer to learn and to develop their skills. Time4Learning’s educational teaching games give students independence as they progress at their own pace. Parents like that it tracks progress and helps kids advance by teaching through individualized learning paths that assure mastery of the skills and concepts that makes kids succeed. Have a child with math and language arts skills at different grade levels? No problem, just tell us in the online registration process. Time4Learning is proven effective, has a low monthly price, and provides a money-back guarantee so you can be sure that it works for your family, risk free!